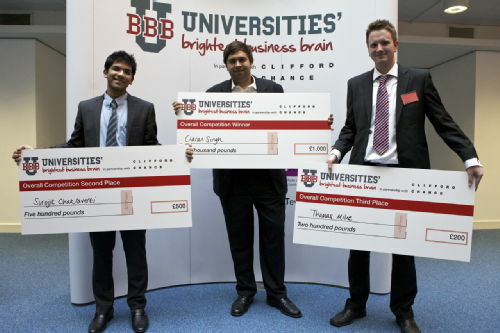 Two students from the University of Warwick claimed the top spots as ‘Best Business Brain’ at the grand final of a national competition held by Cass Business School last week. The two brainy buddies fought off more than 3,000 clever contestants in a competition which saw students compete against each other in a series of online tests to assess the kind of competencies, traits and aptitudes associated with successful business people as well as identifying commercial awareness. First prize of £1,000 went to Ciaran Singh, a final year student studying Philosophy, Politics and Economics, who scored 25.5 out of a possible 30, while second place and £500 went to Surojit Chakraverti who is studying Accounting and Finance at Warwick Business School. With students attending from as far away as St. Andrews University and Durham University the competition throughout the day was intense. The top 60 students were invited to demonstrate their abilities and commercial awareness through six face-to-face assessment exercises created and run by cut-e and the competition’s sponsors including Clifford Chance, Towers Watson and CIMA. The exercises reflected important competencies each of the sponsors look for in students as well as giving the participants a feel for who the sponsors are and what they do. Exercises included an ethics debate around the topic of “Should prisoners have the right to vote?”, a team working exercise called ‘The Great Egg Drop’, a communications exercise called ‘Farmers Exercise’ and a business case study based on a fictitious company called Mackintosh Grant. Both students were thrilled with their win but said it was back to studying as usual this week. Notes to Editors:The competition was run by Target Events with main sponsors being Clifford Chance, law firm; Towers Watson, professional services; CIMA and Cass Business School. The online tests were provided by cut-e who design online assessment tests. For further information contact Kate Cox, Communications Manager, on +44 (0)2476 574255/150483 or m: +44(0)7920 531221 or kate.cox@warwick.ac.uk.